The Miami Marlins head to Citizens Bank Park on Wednesday, September 13, 2017 to take on the Philadelphia Phillies. The expected starting pitchers are Dan Straily for the Marlins and Aaron Nola for the Phillies. The odds for this matchup have Miami at +100 and Philadelphia at -110. The Marlins have a 72-62-9 over/under mark and a 74-69-0 run line record. The Phillies are 77-66-0 against the run line and have a 65-67-11 over/under record. The Marlins have a 68-75 overall record this season. Starting pitcher Dan Straily has a 9-8 record with an earned run average of 3.95 and a WHIP of 1.23. He has 145 strikeouts over his 161.2 innings pitched and he's given up 150 hits. He allows 8.4 hits per 9 innings and he has a FIP of 4.43. The bullpen has an earned run average of 4.36 and they have given up 514 base hits on the year. Teams are hitting .251 against the bullpen and they've struck out 492 hitters and walked 229 batters. As a team, Miami allows 8.8 hits per nine innings while striking out 7.5 batters per nine innings. They are 21st in the league in team earned run average at 4.65. The Marlins pitchers collectively have given up 1,246 base hits and 657 earned runs. They have allowed 159 home runs this season, ranking them 28th in the league. Miami as a pitching staff has walked 536 batters and struck out 1,064. They have walked 3.8 men per 9 innings while striking out 7.5 per 9. They have a team WHIP of 1.40 and their FIP as a unit is 4.53. As a team Miami is hitting .263, good for 7th in the league. The Marlins hold a .425 team slugging percentage and an on-base percentage of .328, which is good for 15th in baseball. They rank 8th in MLB with 9.0 hits per game. Giancarlo Stanton is hitting .281 with an on-base percentage of .377. He has 148 hits this season in 526 at bats with 113 runs batted in. He has a slugging percentage of .644 and an OPS+ of 168. Marcell Ozuna is hitting .305 this year and he has an on-base percentage of .369. He has totaled 166 hits and he has driven in 109 men in 545 at bats. His OPS+ is 141 while his slugging percentage is at .538. The Marlins have 1,293 hits, including 228 doubles and 171 home runs. Miami has walked 423 times so far this season and they have struck out 1,123 times as a unit. They have left 987 men on base and have a team OPS of .753. They score 4.64 runs per contest and have scored a total of 663 runs this year. Philadelphia has a 54-89 overall mark this year. With an earned run average of 3.71, Aaron Nola has a 10-10 record and a 1.24 WHIP. He has 156 strikeouts over the 148 innings he's pitched. He's also given up 140 hits. He allows 8.5 hits per nine innings and his FIP stands at 3.27. The bullpen has an earned run average of 4.46 and they have given up 487 base hits on the year. Teams are hitting .260 against the Phillies bullpen. Their relievers have struck out 460 batters and walked 194 opposing hitters. As a team, Philadelphia allows 9.4 hits per nine innings while striking out 8 batters per nine innings. They are 23rd in the league in team earned run average at 4.74. The Phillies pitchers as a team have surrendered 1,327 base knocks and 666 earned runs this season. They have given up 195 home runs this year, which ranks 7th in Major League Baseball. Philadelphia as a staff has walked 458 hitters and struck out 1,125 batters. They give up a walk 3.3 times per 9 innings while they strike out 8 per 9. Their team WHIP is 1.41 while their FIP as a staff is 4.59. As a team, they are batting .251, good for 19th in the league. The Phillies hold a .410 team slugging percentage and an on-base percentage of .314, which is good for 27th in baseball. They rank 18th in MLB with 8.6 hits per contest. Freddy Galvis comes into this matchup batting .253 with an OBP of .306. He has 138 hits this year along with 58 RBI in 545 AB's. He maintains a slugging percentage of .385 with an OPS+ of 83. Cesar Hernandez is hitting .289 this season and he has an OBP of .360. He has collected 131 hits in 454 at bats while driving in 30 runs. He has an OPS+ of 107 and a slugging percentage of .421. 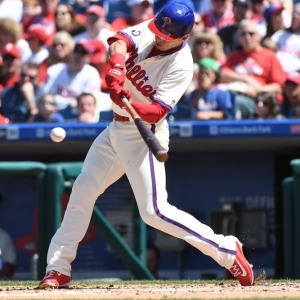 The Phillies as a unit have 1,227 base hits, including 256 doubles and 152 homers. Philadelphia has walked 423 times this year and they have struck out on 1,247 occasions. They have had 955 men left on base and have an OPS of .723. They have scored 4.16 runs per game and totaled 595 runs this season.